The influence of national features in dress in Europe had been declining since about 1675 and by 1800, fashionable dress design had become international. The character of the feminine wardrobe stemmed from Paris, the masculine from London. Until about 1820 women's dress continued to reflect styles initiated by the French. These fashions, were supposedly based upon the classical dress of ancient Greece. Ladies wore loose, draped, high-waisted gowns in white colors. Women wore a minimum of thin garments with little underwear which made it an unsuitable mode of dress during the winters. To attempt to combat the chill, women adopted a threequarter-length overdress made from a warmer material and a variety of shawls, pelisses, and redingotes. The 1830s brought back more color, a tighter waistline at a more natural level. Fuller, shorter skirts, leg-of-mutton sleeves, large-brimmed hats or bonnets also became a norm. The second half of the century was a time of prosperity in Europe. Despite wars, the upper classes dressed fashionably and women would prance about in their walking-dresses. Men's styles remained sombre, dignified, and slowly changing. The ladies fashions were changing ever faster. The technical advances and the capability for mass manufacturing were making fashionable dress available to a rapidly expanding middle class. The invention of the sewing machine and the development of the ready-to-wear trade, new marketing techniques, and the establishment of department stores were revolutionizing the fashion industry. 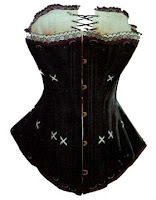 Dress from 1840 onward was dominated by a restrictive corset and framework underskirt. The fullness of the skirt was at first achieved by adding more layers of petticoats, leading to the crinoline petticoat of 1850. Named after the materials from which it was originally made, this petticoat was made of the farthingale and the hoop, a heavy underskirt reinforced by circular hoops. 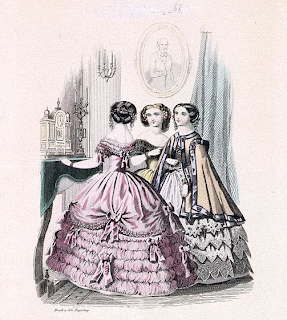 By 1856 the weight of the crinoline and the petticoats became unbearable, and the cage crinoline was invented. This was a flexible steel framework joined by tapes or string and having no covering fabric. 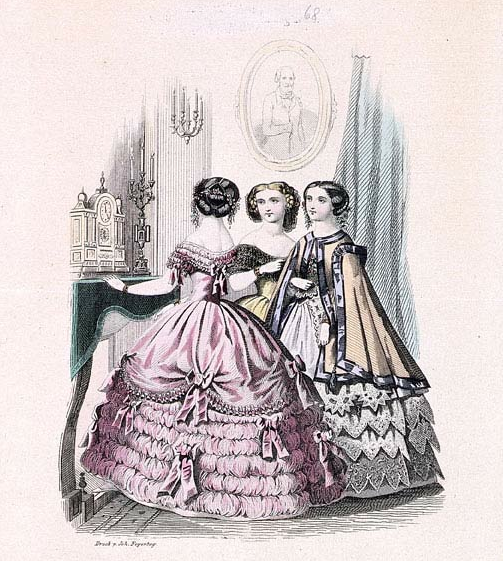 In the 1860s, the shape of the crinoline changed into that of the rear bustle, which was fashionable in the 1870s and '80s. Only in the 1890s did the skirt return to a relatively slender shape, but there was no letup in the constrictive corset. 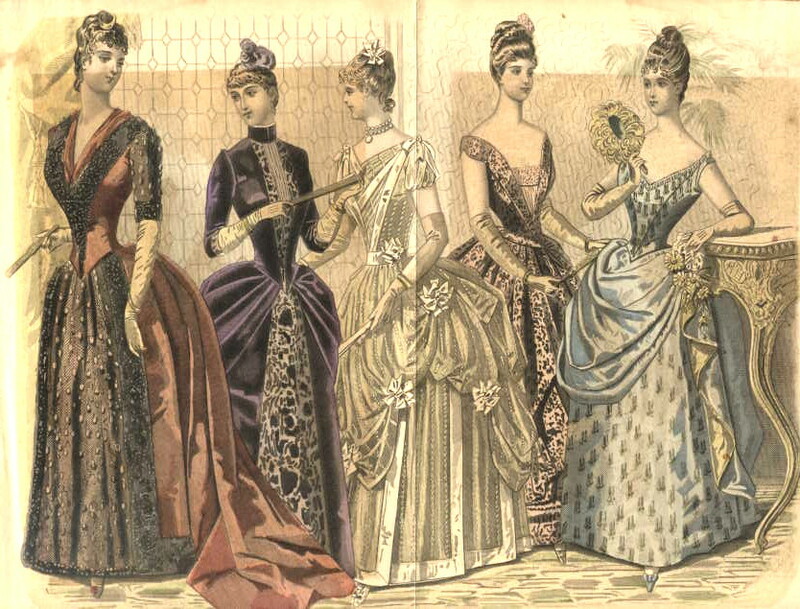 In general, the styles of the late 19th century were elegant but not easy to wear. They restricted movement with their multiple layers, intricate decoration, and sheer quantity of material. The fashion return all the time and Christian Dior is an example. This ball dress „Maria Louisa” from collection haute couture of „Christian Dior” fro the season spring-summer 1998. It is made of silk, synthetic wool and metal threads. 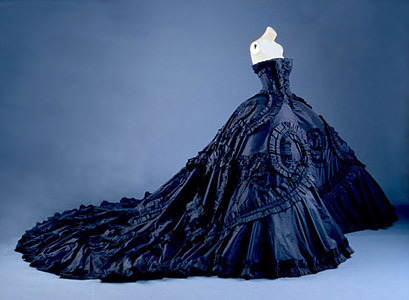 The dress is a gift to the Metropolitan museum from fashion house „Christian Dior” - Paris. The dress is made from John Galliano for „Dior”. It is with loose crinoline silhouette, characteristic for the middle of 19th century. have a look at La Belle Assemblee magazine (regencyfashion.org/bell/ba6-28.html)and at Victoria and Albert Museum(www.vam.ac.uk), the fashion plates of nineteenth century are amazing!